We have two sizes for our pony rides. Which one you choose depends upon the size of your event and how many children you’re expecting to come! 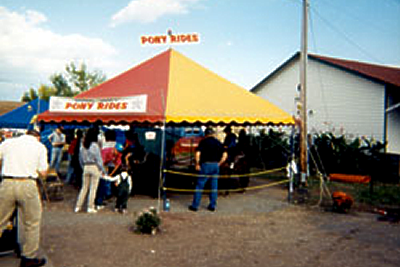 Our 6-Pony wheel is designed specifically for carnivals, fairs and the larger corporate events, our 6-pony wheel can accommodate up to 120 rides per hour. 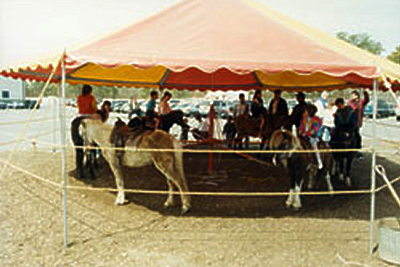 Our optional pony tent will give your event that special “Carnival” feel as well as provide shade and coverage from the elements, making our ponies and our potential customers more comfortable. 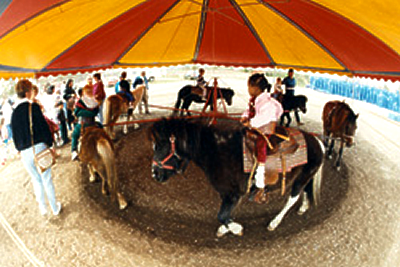 Would you like to have a pony wheel at an event? Well, if our 6-pony wheel sounds great but the size of your event doesn’t require that many rides per hour, then consider our 4-pony wheel. We use the same equipment and the optional tent. The only difference is the amount of ponies on the wheel! Our 4-pony wheel can accommodate up to 80 rides per hour and is perfect for school events, family reunions and smaller company picnics. We would be glad to accommodate you, no matter what size of event you’re having!